[ok] Successfully indexed 366 items. [ok] Successfully indexed 367 items. [warning] Message: 10934 items could not be indexed. Check the logs for details. [notice] Message: Successfully indexed 367 items. A first point is that the word "unreachable" is inaccurate for most (but not all cases) in practice. Also, there are many reasons for getting this error. Don't panic! If your /admin/reports/status page actually shows Solr can be reached and is working, it's probably something about the operation happening at that particular time that is the issue, and not entirely about Solr being generally unavailable. Some Solr requests take a longer time to process than others. When sending such requests, and the response takes longer than the timeout (set within the Search API module's UI), Search API Solr shows the above error. You should try higher values for the timeout settings (just raise the values in the Search API "Server" form shown above). Alternatively, if you're indexing, you can lower the number of items to index per batch to see if that helps. If you need more help, do file a Support Ticket! Search API indexes by groups of items (or "batches"), by getting all the data together in memory on the Drupal side, and then issuing a single POST request to the server. Occasionally, the amount of data in that single request gets too large for our Solr infrastructure to handle, and we respond with a "413 Too Large" HTTP status. The limit is usually hit as a result of indexing large attachments. The limit is around 20MB of data, and can't be changed. Search API then incorrectly logs this as an unreachable on the Drupal side. When indexing, set a smaller batch size. In Drush: specifying the --batch-size option in the drush search-api-index command. In the Drupal UI: edit the Search API "Index" settings and specify a lower batch size. Reduce the amount of data to send to the index by limiting the size of each item. If indexing attachments, under the Search API Index, go edit the "Processors" > File Attachments section. Additionally, you may choose to completely avoid large files by setting "Maximum upload size" to a limit that's right for you. Most of these cases result in an HTTP status 400 ("Bad Request") returned from the Solr backend. Remove any custom code that could result in query syntax that fails. 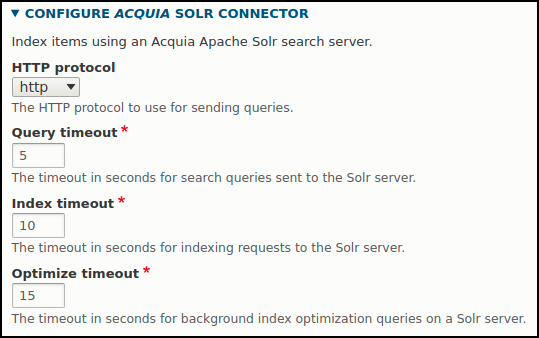 There could be some network issue, or an actual problem with the Acquia Search backend that needs Acquia's intervention. For resolution: please do file a Support ticket! We hope this helps you work through some of these issues; please do ask us if you have any questions! We're here to help.